From our Archives on the old blog. This one is dated June 14. I’m presuming that all the photos being shown next Friday will be of similar interest. Our friend and Las Vegas Historian Brian Paco Alvarez is the curator at the Las Vegas News Bureau Photo & Film Archives, which is managed by the Convention and Visitors Authority. He sent us wonderful piece of Las Vegas History from the Archive. 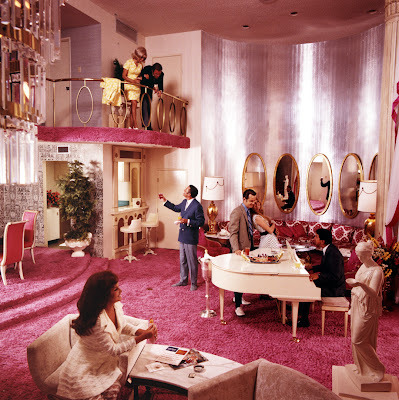 It’s a photo for a print ad for Caesar’s Palace, circa mid 60’s. It’s called “Suite with Piano”. Except for the pink carpet, it reminds me of where we’re having the party at Ben’s house. Would anyone besides me love to have Paco as a guest blogger at VVV? I thought so. (Did you hear that resounding YES, Paco?) You can meet him at the party, and help us lobby him to give up a few minutes a week for us. He’s one of the entrants in the contest.